The last few weeks I was busy, enjoying the nice landscapes of Bavaria and reading Learn PHP 7. The first one was more interesting than the second one definitely, but still reading the book was nice in its own way. So, let’s start with the review – I liked reading the book. In the first chapter, an introduction to PHP is presented, where the PHP environments are explained with screenshots and a simple PHP program is ran. The second chapter puts you a little into the MVC model, which is quite needful for a PHP application. The third chapter is probably the gem of the book – it is the OOP basics in PHP. It is quite nicely explained, I liked it. Chapter 6 was for data objects, starting the real fun with DBs and files. The last two chapters concern authentication and multifunctional interfaces. Pretty much anything you need to build simple PHP applications. Every chapter finishes with a small test of questions, where you should select the correct ones, true/false questions, projects proposal and a term project proposal. E.g. the third project of the second chapter looks like this – “Adjust the Hello World program to display your college/university name, address, main phone number. With the time, the projects get tougher, of course. 1. Could not find a real minus, it goes step by step into the technology. 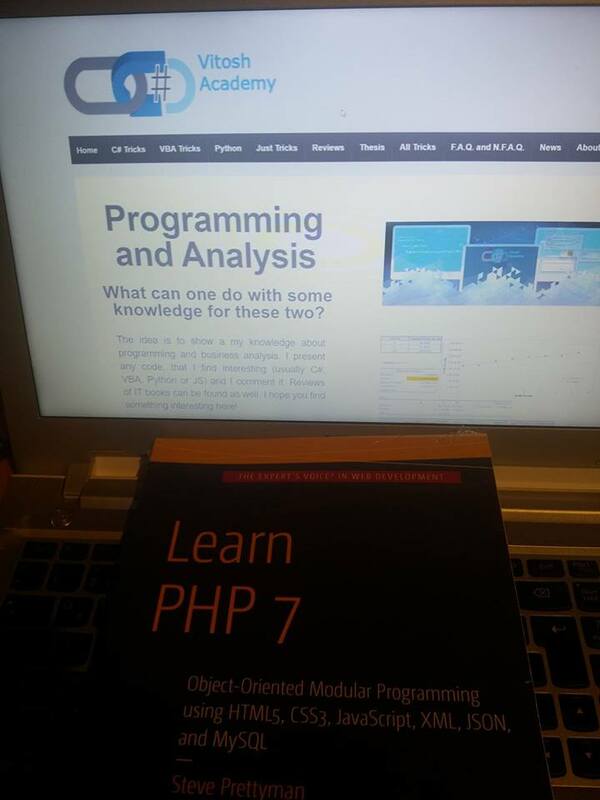 However, the book is really much into PHP7, but you probably need to be well-informed with the basic principles and techniques of programming in advance (e.g. loops, methods, arrays) in order to get the most of it. 1. The book gives access to the code online for anyone, without even a need to buy the book. Thus, you can go on the site and check for yourself, whether it would be useful. 2. I liked the questions and the projects at the end of each chapter. 3. Well written, I liked it.